RELATED: Turkey Talk: What Do Labels Like “Young,” “Fresh” And “Natural” Actually Mean? 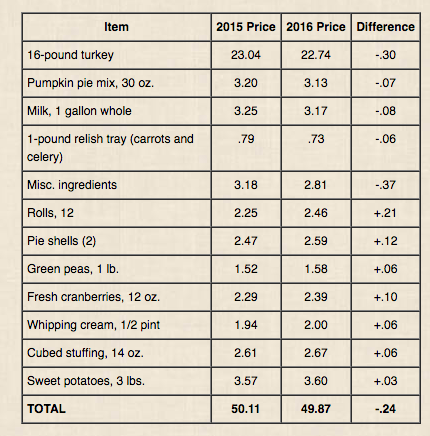 Other foods that saw a decrease in price include pumpkin pie mix, milk, and a veggie tray of celery and carrots. You may pay slightly more for things like a dozen brown-and-serve rolls ($2.46); two nine-inch pie shells, ($2.59); one pound of green peas ($1.58); 12 ounces of fresh cranberries ($2.39); a half-pint of whipping cream ($2.00); a 14-ounce package of cubed bread stuffing ($2.67); and a three-pound bag of fresh sweet potatoes ($3.60). “Consumers will pay less than $5 per person for a classic Thanksgiving dinner this year,” AFBF Director of Market Intelligence Dr. John Newton said. “We have seen farm prices for many foods — including turkeys — fall from the higher levels of recent years,” which translates into lower retail prices for many items in the runup to the holiday, he adds.